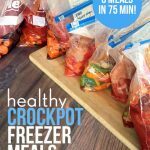 I made three bags of this Crockpot Tomato Turkey and Vegetable Soup during a freezer meal prep session after shopping at Costco. After tasting it, I knew it needed a blog post all of its own. It was delicious! I don’t think I’ve ever had ground turkey that flavorful before. If I didn’t make it myself, I would have argued that it was a different meat altogether. You can make this soup fresh or frozen, so I’m including directions for both below. Your whole family is going to love this simple, delicious, and healthy dish! Combine all ingredients in crockpot and cook on “low” setting for 8 hours, or until carrots are soft. Break apart turkey, stir, and serve. 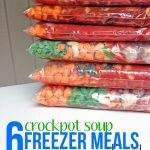 Combine all ingredients (except water) in a gallon-sized plastic freezer bags (affilliate link). 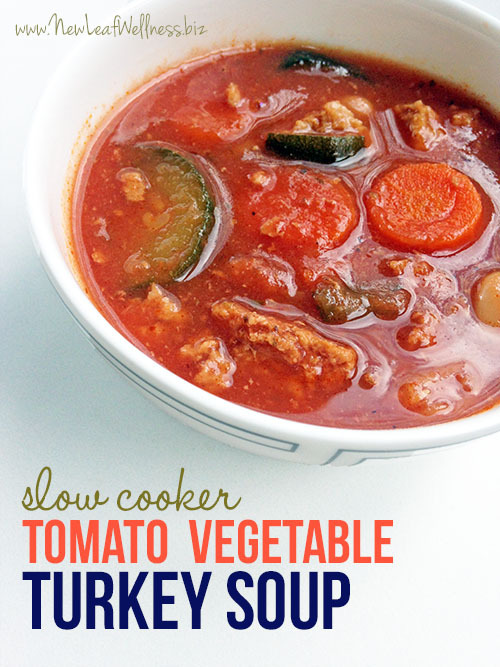 Add the ground turkey to the bag last so it’s the first ingredient poured into your crockpot. Remove as much air from the bag as possible, seal, and lay flat in your freezer. 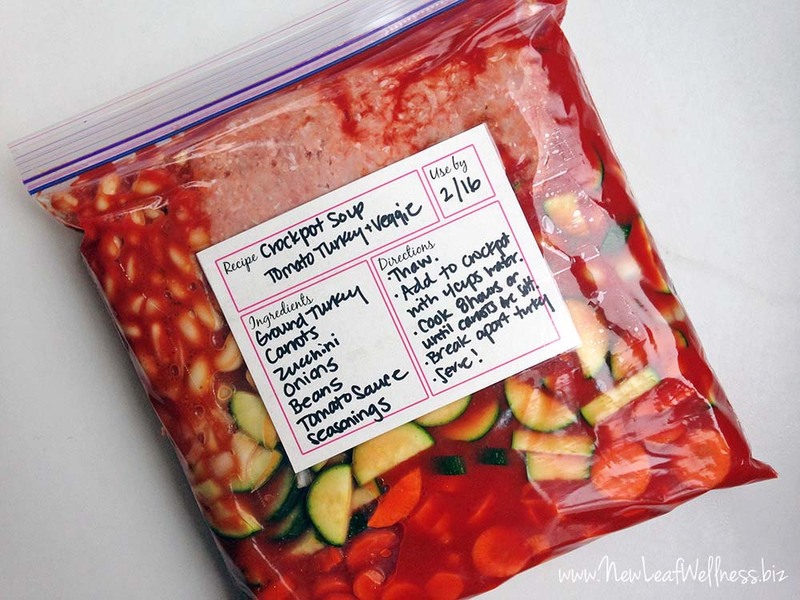 When ready to cook, thaw overnight in the refrigerator or in a bowl of water. Add to crockpot with water and cook on low for 8 hours or until carrots are soft. Thoughts or questions? Leave a comment below. I’d love to hear from you! 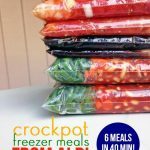 PS For more easy freezer recipes, check out my No Cook Freezer Meals cookbook bundle. 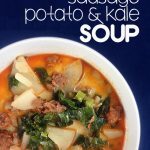 Super easy soup with sausage, potato, and kale! Where’s your pin button? This soup looks so good — I want to pin it! Thank you! No worries! You’re doing an awesome job as a one-woman show. I really enjoy your blog and visit often. Hi, Kelly. Love the simplicity of this recipe. Thanks for posting it. I was wondering if you’d recommend using 85% lean turkey over 93% lean turkey. I’m guessing that the 85% lean turkey will be more tender and withstand the long cooking time better. What are your thoughts? So glad you liked it! I’ve had the same issue with my bags so I bought these baggie clips. So excited to use them! ok, I’m a guy who doesn’t cook much and I have a dumb question. Aren’t you supposed to cook/ brown the Turkey first before putting it into the crock pot, or per what I’m reading here, you just put it in raw and the 8 hours in the pot cooks it? (Go ahead and laugh). No such thing as a dumb question, Greg. I add my meat raw, but you can brown it ahead of time if you want. I need to thank you for posting these recipes! I saw the link making its rounds on Facebook and decided to try them out. My co-workers and I have prep parties and make 4 recipes at a time. I haven’t had a meal I don’t like yet! They are great and I love the healthier aspect of creating your own sauces instead of buying premade jars. If you buy all the ingredients fresh, and decide to freeze until later. How long can you leave it in the freezer for?